There’s no such thing as a cat proof couch, but in terms of sofa materials that rank best for cat owners, leather is probably #1 or #2 on the list. In my opinion, no material does better for scratch and spill prevention overall, though velvet can be a little more hard-wearing when it comes to weathering scratches, and pleather can be a smidgen better at handling spills. Yet we’re here to talk about how you can keep cats from scratching up leather furniture, so you must already have a leather sofa or seat you’re trying to protect from kitty claws. Meaning you already know your cat is the type of furry who’s keen on clawing up the leathery stuff. There are actually a number of felines who like to take their claws to leather, so if it brings you any comfort, know you’re not alone. Before getting into the rest of this article, I’m going to speed through a discussion of declawing and nail caps. Declawing, I don’t think is ethical, and thus I don’t think it should ever be considered an option for keeping cats from scratching leather. Nail caps like Soft Claws, since they’re not permanent, damaging to feline anatomy, and don’t appear to change cat scratching behaviour (which is extremely beneficial for many reasons to feline health & well being), are in my opinion ethically fine, yet I still believe they can be incredibly dangerous. 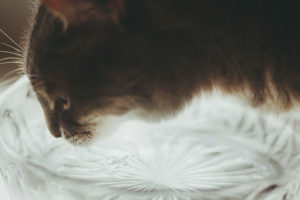 Some cats end up removing nail caps and swallowing them, which can be a choking hazard or cause pets to need surgery. Infrequently, vets have reported seeing caps grow into toes. Assuming neither happens to your cat, I still personally think they’re pretty dangerous. Why? Imagine your indoor cat accidentally wanders outdoors. Freshly put on nail caps means huge trouble – there’s no way for your cat to defend him/herself from other cats, dogs, raccoons, basically anything that may attack it. Your cat can’t climb easily to run away, and without use of his or her sharp nails, hunting to eat will also be practically impossible. What this means is that your cat’s ability survive long enough for you to find him or her is severely limited if you opt to use nail caps. 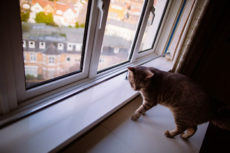 If you’re okay with these risks, say because you know for a fact your cat can’t escape, I do think they’re fine to use, but if like the majority of us, your house is not a fortress and your cat is sometimes curious or easily spooked and you believe it’s possible for him or her to get lost momentarily outside, I’d personally opt out of using nail caps entirely. 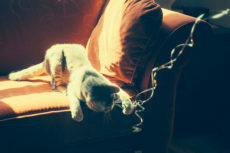 Again – still plenty you can do about protecting the leather furniture – but none of my solutions have anything to do with modifying your cat’s nails directly. 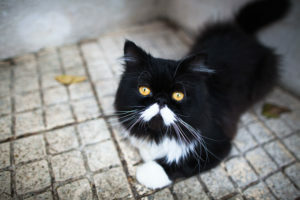 Of course, I don’t need to say it because you already know – keeping a cat’s nails trimmed helps to minimize damage as much as possible, but that doesn’t prevent cats from scratching furniture in any way, thus it doesn’t deserve mention in the body of this article. 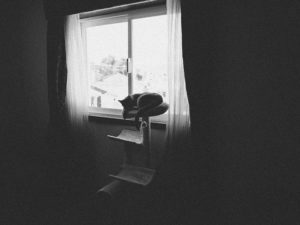 What I’ll be discussing in the remainder of my post are three different options – all incredibly effective – for stopping a cat from scratching leather furniture. The first option includes products you can buy to place on or attach to your couch to keep it from dying a miserable death by cat scratches. 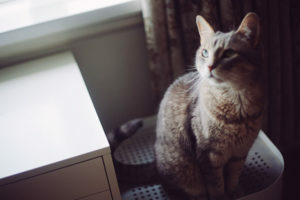 The second option relates to how you can train your cat to stop scratching furniture entirely, especially helpful in case your leather sofa isn’t the only furniture piece you’re trying to protect from claws. Finally, the third option, which is definitely best if used in conjunction with option #2, is increasing the amount of scratch-worthy items in your crib, as well as working on placement of these items in a way that will make the couch less appealing to scratch than those scratch-able things. Let’s start at the beginning! The quickest and easiest remedy to the problem of a cat scratching leather furniture is to invest in some type of furniture cat scratch protector. There are a number of different types of these on the market, so I’ll give you a quick rundown of each. 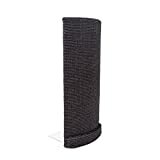 Couch protector covers cover chairs, sofas, and other furniture fully or partially, protecting from not only scratches, but a lot of times, from spills (think cat pee or cat vomit) as well. They come in the form of plastic covers that are see-thru and can completely cover the entirety of the couch when you’re away from home and unable to monitor your cats (ex: Kitty Cat Protector Plastic Couch Cover For Pets). They also come in the form of slipcovers that are waterproof in case your kitty has a lot of accidents (ex: Mambe 100% Waterproof Furniture Cover). Some – made of fabrics from cotton to velvet – can completely transform an old, scratched up looking sofa into one that looks like new. Keep this in mind in case you reach a point where you’re happy with the comfort of your couch, but can’t stand the way the scratches on it look anymore (ex: Chunyi Jacquard Sofa Covers). 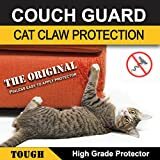 Clear plastic cat scratch guards are, in my opinion, the most beneficial type of furniture protector if you’re trying to avoid damage – or further damage – to specific parts of your couch. They’re see-thru with either sticky tape backing that works on leather, or if you have some re-upholstered fabric furniture you’d also like to protect, you can grab them with push pins instead (ex: Couch Guard the Cat Claw Protector). Couch cat scratchers take the well-known proverb, “If you can’t beat them, join them!” and apply it to cats scratching up your furniture. What are they? 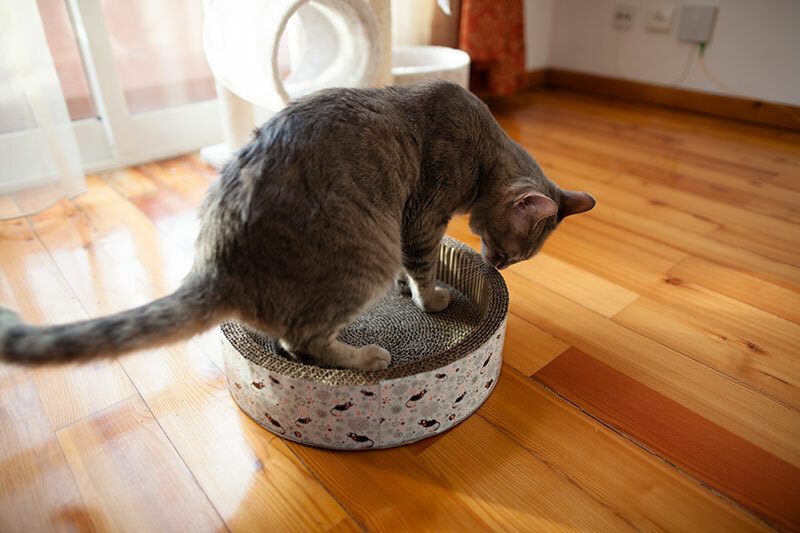 Essentially scratching posts and scratch mats you can throw on your sofa, usually on the front corners or the sides of the sofa where cats typically scratch, thus covering up any damage that’s already there while also helping cats give in to their desire to scratch in a way that’s non-destructive. Some of these are really cool looking and can really improve the aesthetic of a couch-gone-shredded (ex: Sofa-Scratcher’ Cat Scratching Post & Couch-Corner/Furniture Protector). 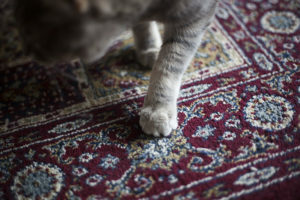 Listen, if your cat is scratching up your leather couch, but is also scratching up a heck of a lot more, and you want him/her to cut it out and find someplace else to dig his/her claws into, you probably should take the time to train your cat to stop scratching where you don’t want those nails digging deep. It really is worth undergoing this type of training, though of course it takes some time and effort on your part. Honestly, it’s not hard at all, just takes patience. Train your cat where you don’t want him/her to scratch (i.e. your leather sofa, etc.) – mostly by scolding, startling, possibly even spritzing your cat with water, when you catch your cat in the act of scratching where he/she should not scratch. Then.. 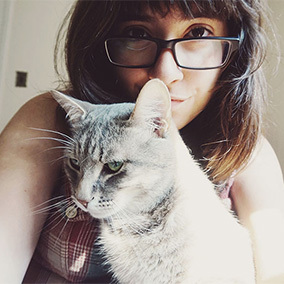 Train your cat where you do want him/her to scratch (scratch posts, cat trees, blankets you leave out for him/her, carpets if you’re okay with that). Reward, reward, reward – with catnip, cuddles, affection, etc. when this happens. You see your cat scratching the wrong item? Scold, and relocate to a “scratch appoved” spot, then when scratching ensues, reward for clawing up the right item. And that’s it. Keep doing this over and over for some time, your cat’s likely to get the picture and start scratching up things he/she should be clawing instead of things you want never to be touched. Obviously, I have a lot of tips related to how to do this, otherwise I wouldn’t have dedicated a full article to it, so again, check that out here if you want to learn more. While I can’t guarantee your cat will be successfully trained to stop scratching all furniture by any means, I’m pretty sure for most cats, it will be effective at reducing the scratching considerably, at least getting them to cut out most human furniture clawing. If you have a leather sofa your cat really likes to scratch, it may not be that he or she actually genuinely prefers to scratch leather over other materials. 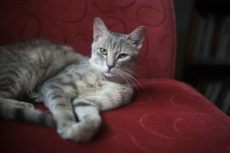 The truth of the matter is that your cat may just scratch your sofa because when he/she gets the itch to scratch around it, there’s nothing else nearby that’s nice to scratch on, so your leather furniture gets the grunt of the claw-work. We spend a lot of time on and around our couches, and cats like spending a lot of time around us. If there’s specific furniture in your house that’s more damaged than other pieces, I’ll hazard a guess the damaged pieces happen to be where you spend a large chunk of your waking hours. The resolution to all this? Increase the amount of scratch-approved items you have in your home, concentrating especially on places your cat (and usually you!) spend a lot of time. And I’m not just talking in the same room either. Some rooms are enormous, and some rooms are small, yet certain cats really dislike having to go even a little far from where they’re spending time to find something adequate to scratch. The easiest way to make sure a scratcher isn’t too far to be a suitable replacement for the leather couch? 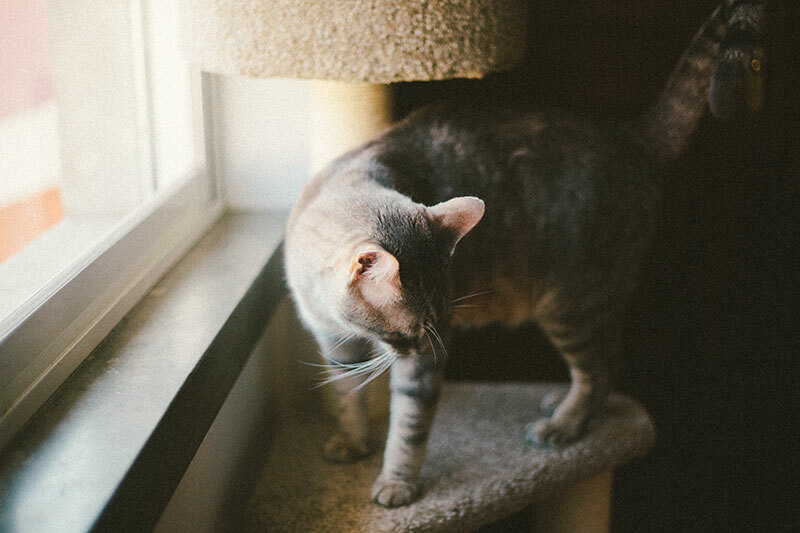 Place a scratch post you know your cat likes to use right in front of the spot your cat typically scratches on your leather sofa – like the back, the sides, the front, wherever your particular cat likes clawing. That work? Good, now grab as many scratchable things as you can, up your scratch-worthy item game to the point where your cat’s not interested in human furniture anymore. Don’t really have the space because you live in a small apartment? 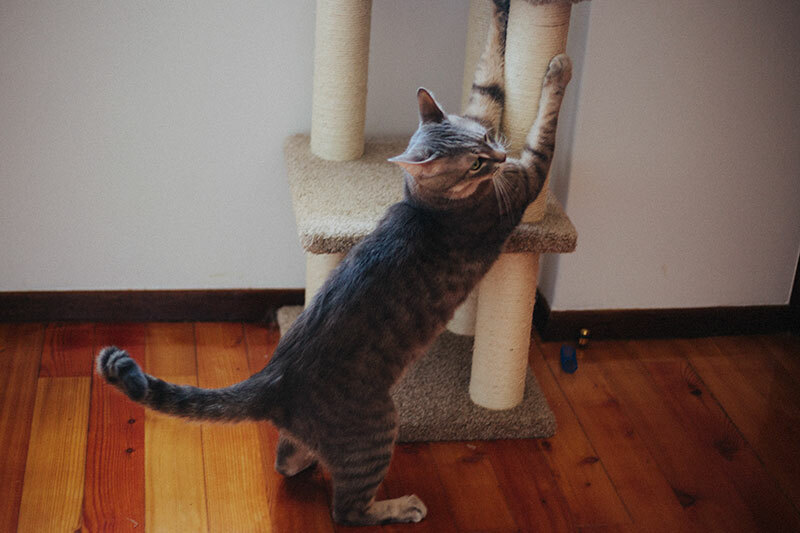 There are quite a number of narrow, tall cat trees that work really well for slim areas of your home. 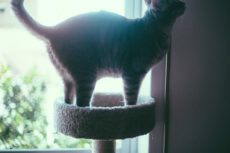 Or, if you’re not afraid of drilling into walls or floors, you could go the hyper minimalist, most aesthetically pleasing, cheapest, and most space-efficient route by grabbing floor-to-ceiling cat trees for your crib. Have the opposite problem? Have a lot of space, and thus need quite a lot of scratch able surfaces? Don’t break the bank. Besides scratching posts, you can also grab cardboard cat scratchers for your cat to use instead. They’re really well loved by so many cats, and are so easy to move around to different spaces, you can bring ’em around with you as you move from room to room if you want. Prefer a cat tree, but worried about the price? Try some of these inexpensive cat towers – there are some excellent finds out there. 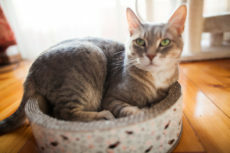 Then there are a plethora of small cat trees – which are essentially scratch posts with beds and other cat-friendly features like toys integrated into them. They’re excellent for rooms in your house your cat goes into regularly, but not regularly enough for a whole cat tree. I have one in the spare bedroom my Avery uses to play with his springs in, for instance. Really hate the idea of having your home overrun by cat stuff? Would prefer it if your cat scratch surfaces were low-key, in cognito and blended in with the rest of your stuff? 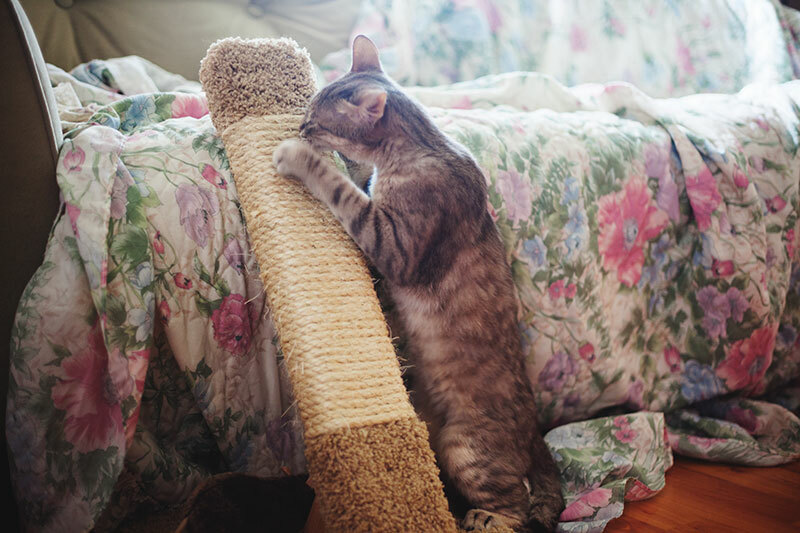 There are so many different everyday alternatives you can use as replacements for scratching posts – things like furs, rugs, blankets. 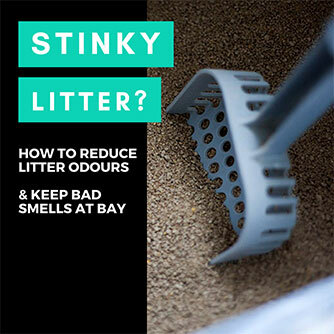 As long as you have enough of those as approved places for your furball to scratch, and your cat knows what’s fair game for his/her claws and what’s not, your sofa should be pretty safe from harm. That probably means placing a rug (like a nice big Persian style rug, or one made out of sisal!) 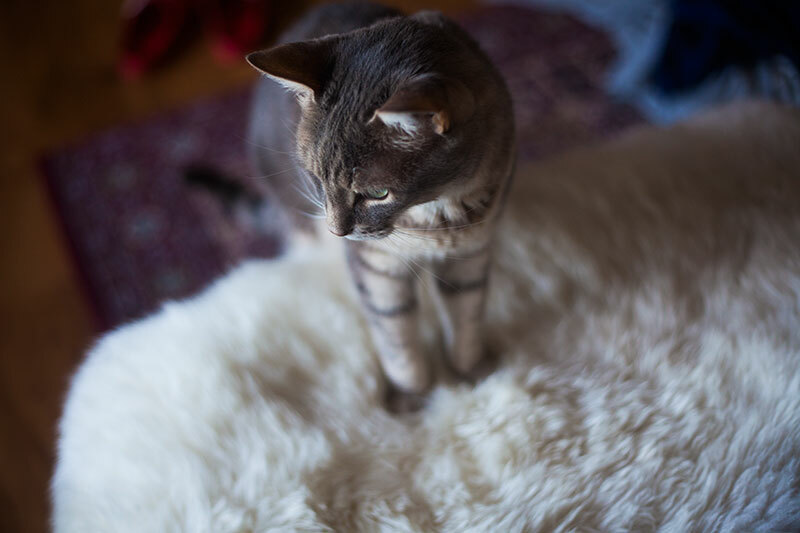 right beneath your leather sofa’s feet or draping a scratchable mat, blanket, or fur over the side to keep your cat from damaging the furniture. Your Thoughts on Cats Scratching Leather? Do you have any tips, tricks, or stories about cats scratching leather? Do you have a leather sofa at home? Has your cat ever tried to claw it up? 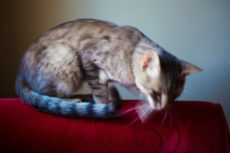 Which section of the couch does your cat like to scratch? Have you ever tried to repair a leather sofa that’s been damaged by cat scratches before? Have you tried anything in terms of prevention? What worked? What hasn’t? Please leave your thoughts and experiences in the comments below – I’m sure every pet parent in this boat will be grateful for the advice! The Hubby has talked about getting a couch or love-seat, and he wants leather while I want fabric! He swears the leather will wear better, but I’m vegan for a reason!!! I’m okay with fake leather, I guess. Good post, thanks!